There has never been a better time to secure your next winter family holiday with our great value for money winter holidays to Bulgaria and Slovenia available with a number of properties that offer Free Child Places. Book early and save with our brilliant selection of Family Discounts but hurry as they go fast! There are free places* for children aged 2-11 years inclusive in all hotels showing our "Free Kids" logo, on all departures excluding 25 Dec-31 Dec and 12-18 Feb. This offer applies to charter flight holidays to Bulgaria only. There's up to 50% off for children (2-16 years), as long as they're sharing with two full fare paying adults (check the hotel pages for applicable age). Larger families get the best deals in a family room. Kids (up to 11 years) get great discounts on excursions and entertainment as well - ranging from 40-50% off! Skiing or boarding as a family is great fun and it's also great value because we offer a special family insurance policy (the child age for insurance is 17 or under on the date of return). Please pick up a copy of our brochure or call our Reservations Department on 0207 543 5555. We have a choice of hotels where single parents can make additional savings. See this logo for applicable hotels. Please pick up a copy of our brochure or call our Reservations Department on 0207 543 5555. Any holiday with Balkan Holidays is ideal for families because we offer real value for money. We have put together these great offers to help all the family ski together - just watch out your kids don’t show you up on the slopes. 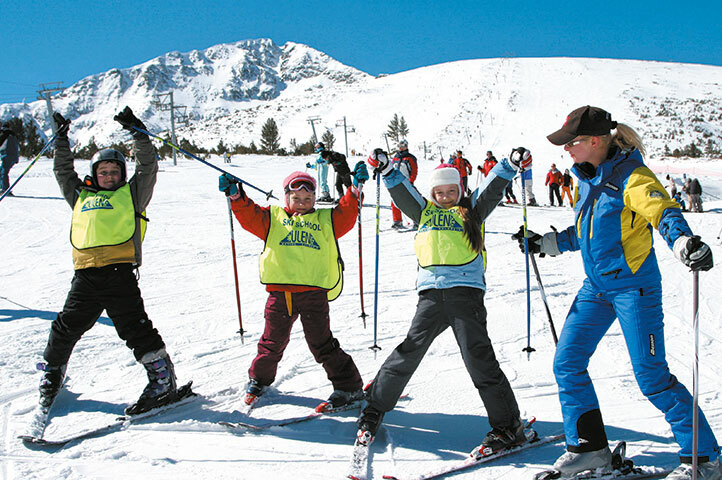 In Bansko, if both parents pre-book "Full Ski/Snowboard" packs or "First Time Ski/Board" packs one child 4-7 years old receives a free place in the Junior Ski Club and one child 8-11 years old receives a free place at the ski school for 6 days. *** Children 4-6 years receive a free lift pass when accompanied by a paying adult. Please call reservations to book. In Pamporovo, if both parents pre-book "Full Ski" pack, one child aged 5-6 years may attend the ski kindergarten free or one child aged 7-11 years receives a free lift pass. This offer excludes departures on the 28th December 2019 and 15th February 2020. Hotel Rila in Borovets, pre-book an adult lift pass and get a free lift pass for one child. Pre-book an adult ski pack and get the same ski pack for one child at half price. Hotel Samokov in Borovets, if both parents prebook a ski or snowboard pack, up to 2 children get either a free ski equipment or a free place at the ski kindergarten. Family offer for ski and snowboard holidays in Slovenia - ski and snowboard equipment and tuition when 2 adults and 2 children up to 13 years buy any of these services, the second child is entitled to receive the same services free of charge. * All free places are subject to availability on charter flights to Bulgaria only, limited to one child per booking sharing with two adults, with the appropriate child reduction for the second child. Children between 12-16 years pay adult price for ski packs. ** Offers and incentives can not be used in conjunction with each other and can be withdrawn at any time without prior notice. All passengers must be under the same booking reference number. *** The Free Place at the Ski School does not include a lift pass or equipment.